Fasting is a religious ritual which is practiced by most of the religions all over the world. There are several religious fasting, such as Islam, Hinduism, Buddhism, Judaism and 7th-day Adventism that have often been studied regarding their relation to health.,,,,,,,,,,,, In Egypt, we have religious fasting among Muslim in Ramadan and Christian fasting among Coptic Orthodox. Several studies were conducted about fasting in Ramadan. However, there are limited studies about Coptic Orthodox Christian fasting. Egypt is one of the top ten countries worldwide with the highest number of diabetic population among people aged 20–74 years. Religious fasting is often a time of great spiritual growth, and it may have a metabolic effect on physical health. The Coptic Orthodox Church specifies dietary restrictions and fasting for a total of 220–250 days annually. Several religious fasting has been studied regarding their relation to health.,,,,,,,,,,,, However, the studies on Orthodox Christianity fasting are very limited. There are three principal fasting periods per year in Orthodox Christianity: (i) a total of 40 days preceding Christmas (meat, dairy products and eggs are not allowed, while fish is allowed except on Wednesdays and Fridays), (ii) a period of 48 days preceding Easter (Lent). During Lent, fish is allowed only 2 days whereas meat, dairy products and eggs are not allowed, (iii) a total of 15 days in August when the same dietary rules apply as for Lent except fish consumption which is allowed only on 6th August, a strict abstinence period, where no food or drink is encouraged for those who can endure it. The original tradition of the church is for this period of abstinence to begin at midnight and last through sunset. Those who cannot endure this length of fast are still encouraged to strictly abstain from all types of food and drink between midnight and a certain time in the day, depending on each individual's ability and spiritual needs. Studies on health effect of Christian fasting in Egypt are lacking. Therefore, this study was designed to assess the health effects of Coptic Orthodox Christian fasting on patients with and without Type 2 diabetes mellitus (DM) and to help Egyptians to build up health education programmes for safe fasting. Our study was the first study that focussed on the health effects of fasting among Coptic orthodox Christian patients with and without Type 2 DM in our locality in Egypt. The present study is a prospective study that was carried out in Sohag San George Church, Egypt. The study was conducted on Coptic Orthodox Christians with and without Type 2 diabetes aged ≥18 years during the period of Great Lent 2013. An announcement was made inside the church by the church's authority about participation in the study. An explanatory session about the aim of the study was given by the investigators and written consent was obtained from each participant. The study was observational; thus, the participants were not given advice with regard to diet or drug therapy during fasting of Great Lent. The study was approved by the Scientific and Ethical Committees in Faculty of Medicine, Sohag University, and from the Head/Papa of Sohag San George Church. Coptic Orthodox Christians who accepted to participate in the study were included. Exclusion criteria were (a) patients with Type 1 DM, (b) non-fasting Coptic Orthodox Christians, (c) patients with advanced renal, cardiac or liver disease, (d) participants who did not fast the whole period of Great Lent and (e) patients who had received drugs that could affect serum lipid level other than statins such, diuretics, oral contraception and corticosteroids within the past 6 months. Patients who were receiving statins were included and continued their medication without change in the drugs or in the doses. The participants who fulfilled the inclusion criteria were divided into two groups. Group I included diabetic patients with Type 2 DM and Group II that included non-diabetic individuals. Patients were studied before and followed up after Great Lent fasting. Two measurements were made coinciding with the beginning and end of fasting period. Measurements included anthropometric measurements, laboratory investigations and completion of study questionnaires. At the pre-fasting interview, the study questionnaire was completed by each participant. The questionnaire included information regarding diet, physical activity and detailed medical history including duration of diabetes, complications and drug treatment. At the end of the 7th week of the Great Lent, studied groups were asked if they had experienced signs or symptoms suggestive of hypoglycaemia or developed acute metabolic complication. The questionnaire also included the information regarding associated comorbidities. Meticulous assessment of systolic blood pressure (SBP) and diastolic blood pressure (DBP) was done for each participant. It was measured in the right arm with the person in the sitting position after 5 min of rest. A standardised mercury sphygmomanometer was used. Body weight was measured by calibrated portable scales with an accuracy of ±100 g. Participants were weighed barefoot in light clothing. Standing height was measured without shoes to the nearest 0.5 cm using a measuring rod with the shoulders in relaxed position and arms hanging freely. Body mass index (BMI) was calculated by dividing weight (kg) by height squared (m2). Waist circumference was measured in centimetre by placing a measuring tape midway between the top of the hip bone and the bottom of the ribs and wrap it around the waist with the tape snug but did not compress the skin and it was parallel to the floor. The measurement was made at the end of a normal expiration to the nearest centimetre. Ten millilitres of venous blood sample was withdrawn from each participant after 12 h of fasting by venepuncture into dry tubes for the pre- and post-fasting periods. All blood samples were transferred within 1 h to the laboratory for processing and allowed to clot, and the serum centrifuged, divided into aliquots and stored at −18°C until analysed. Glucose in mg/dl, glycosylated haemoglobin (HbA1c) %, triglycerides (TGs), total cholesterol (TC) in mg/dl, high-density lipoprotein cholesterol (HDL-C) in mg/dl and low-density lipoprotein cholesterol (LDL-C) in mg/dl were measured from each of the 97 blood samples. Statistical analysis was conducted using SPSS 11.0 for Windows (SPSS Inc. Chicago, U.S.A.). Chi-square test was used to assess association between categorical variables. Mean ± standard deviation was used to measure the degree of dispersion of data around their mean. Paired samples t-test was used to the compare quantitative data before and after fasting. Quantitative data were compared using Student's t-test to compare mean of two groups when the data were normally distributed. Mann–Whitney test was used to compare mean of two groups when the data were not normally distributed. Significant results are considered when P < 0.05. The study involved two groups from Sohag San George Church during the period of Great Lent 2013. Group I included 49 Coptic Orthodox Christians with Type 2 DM involving 24 (49%) males and 25 (51%) females with age ranging 39–84 years (59.5 ± 8.3). Forty-two (85.7%) patients were previously diagnosed as diabetics while 7 (14.3%) were first discovered to be diabetics in our study. The patients did not receive clear instructions and recommendations from their health-care providers about diabetes during fasting. Group II involved 48 non-diabetic persons including 26 (54%) males and 22 (46%) females with age ranging 22–72 years (50.6 ± 12.7). The clinical characteristics of each group are shown in [Table 1]. In Group I, the mean SBP before and after fasting was 138.9 ± 17 and 129.8 ± 15, respectively, and changes in SBP were statistically significant with P = 0.0001. The mean DBP after fasting was lower than that before fasting, e.g. 80.3 ± 9.8 and 82.8 ± 8.6, respectively, and the difference was statistically significant with P = 0.047 as shown in [Table 2]. Among diabetic patients, 23 (46.9%) patients were hypertensive. In those hypertensive patients, the mean SBP before and after fasting was 143.4 ± 19 and 136.3 ± 16, respectively, and changes in SBP were not statistically significant with P = 0.07. The mean DBP after fasting was lower than that before fasting, e.g. 84.1 ± 10 and 85.6 ± 8, respectively, and the difference was not statistically significant with P = 0.35. In Group II, significant changes were detected neither in SBP nor in DBP after fasting compared to before fasting as shown in [Table 2]. In Group I, the mean BMI before and after fasting was 30.2 ± 5.1 and 29.7 ± 5.1, respectively, and the difference was statistically significant with P = 0.0005. The mean waist circumferences before and after fasting was 109.9 ± 10.3 and 108.7 ± 10.5 cm, respectively, and the difference was statistically significant with P = 0.001 as shown in [Table 2]. In Group II, the mean BMI before and after fasting was 31.6 ± 5.5 and 31.2 ± 5.7, respectively, and the difference was statistically significant with P = 0.03. The mean waist circumferences before and after fasting was 100.6 ± 14.0 and 100 ± 14.3 cm, respectively, and the difference was statistically significant with P = 0.03 as shown in [Table 2]. Group I showed no significant changes in mean fasting blood glucose (FBG) after fasting in comparison with mean FBG before fasting (187 ± 56.1 and 197.1 ± 75.9, respectively). Eight (16.3%) patients developed increase in their HbA1c after fasting in comparison with their HbA1c before fasting and 41 (83.6%) patients developed decrease in their HbA1c. The mean HbA1c before and after fasting was 9.4 ± 2.3 and 8.6 ± 1.9, respectively, and the difference was significant with P < 0.0001 [Table 2]. In Group II, 32 (66.6%) persons developed increase in their FBG after fasting in comparison with their FBG before fasting while 2 (4.1%) persons showed no change and 14 (29.1%) persons developed decrease in their FBG with significant P = (0.0002). The mean FBG after fasting was more than that before fasting, e.g. 103.3 ± 4.7 and 100.6 ± 5.0, respectively, with statistically significant results [Table 2] and [Table 3]. In Group I, 19 (38.7%) patients developed increase in their serum TGs level after fasting in comparison with their serum TG level before fasting while 2 (4%) patients showed no change and 28 (57.1%) patients showed decrease in their level. The mean of serum TG before and after fasting was 150.1 ± 66.2 and 141.8 ± 57.2, respectively. However, the difference was not statistically significant. Twenty-seven (55.1%) patients developed increase in their serum cholesterol level after fasting in comparison with their serum cholesterol level before fasting while 22 (44.9%) patients showed decrease in their level. There were no significant changes in the mean values of serum cholesterol, LDL and HDL after fasting compared to before fasting [Table 2] and [Table 3]. In Group II, the mean values of serum HDL before and after fasting were 42.9 ± 10 and 40.9 ± 8.5, respectively. Reduction in HDL after fasting compared to before fasting was statistically significant with P = 0.04. However, there were no significant changes in the mean values of serum TG, cholesterol and LDL after fasting compared to before fasting as shown in [Table 2]. Among diabetic patients, our study showed that 21 (42.9%) patients were on single oral drug being metformin or sulphonylureas, 14 (28.6%) patients were on metformin plus one of sulphonylureas group, 13 (26.5%) patients were on insulin alone and only one (2%) patient was on insulin plus metformin [Table 1]. Changes in the mean SBP in patients receiving insulin therapy compared with those receiving combined oral therapy were much lower and statistically significant (P = 0.04). However, there were no significant changes in the mean of SBP, DBP, BMI and lipid profile after fasting compared with before fasting regarding the medications that used in DM treatment during fasting period. 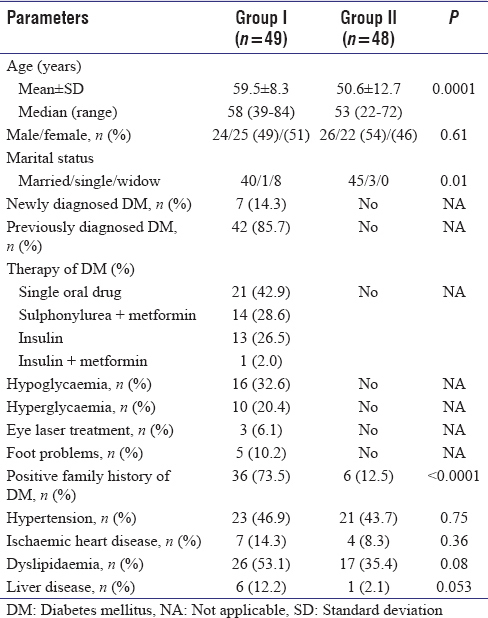 Family history of DM was detected in 36 (73.5%) patients among diabetic group and only in 6 (12.5%) patients among non-diabetic group and P < 0.0001. There were no significant differences in other parameters of medical history between the two groups as shown in [Table 1]. The mean SBP changes after fasting in diabetic and non-diabetic were −9.18 and −1.67, respectively, and the difference in mean change was statistically significant (P = 0.02). 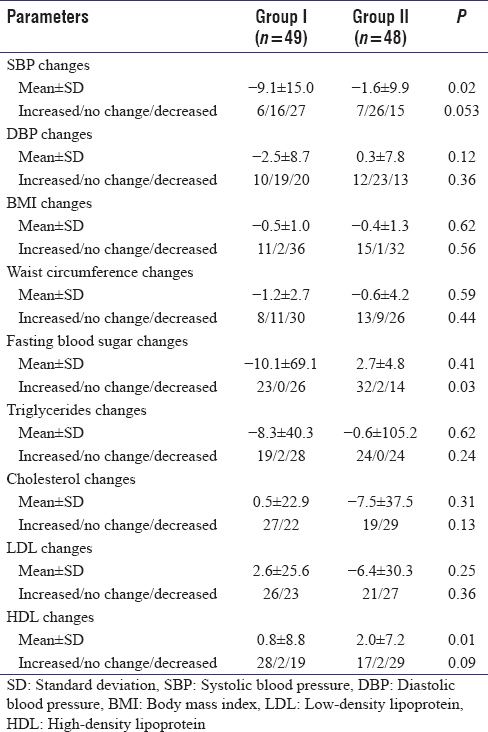 There were no statistically significant differences in changes in DBP, BMI and waist circumference after fasting in diabetic patients compared to changes in these parameters before fasting in non-diabetic individuals [Table 3]. There was significant difference in changes in FBG after fasting between diabetic and non-diabetic groups and P = 0.03. Increase in HDL was detected in 28 (57.14%) patients with DM compared with 17 (35.42%) persons without DM. The mean HDL changes in diabetic and non-diabetic after fasting was 0.86 and 2.02, respectively, and the difference was statistically significant (P = 0.01). There were no statistically significant differences in changes in other lipid profile between Group I and Group II as shown in [Table 3]. Religious fasting is expected to have metabolic effects on human health. Several studies were performed during fasting of Ramadan and fasting of Greek Orthodox. Fasting in Ramadan includes complete cessation of all-type food and drink intake during certain period of time on the day. The Coptic Orthodox Christian fasting is unique in regularly interchanging from an omnivore to a vegetarian-type diet. The current study was conducted on 49 patients with Type 2 DM and 48 persons without Type 2 DM attending San George church in Sohag during the period of Great Lent. Patients with Type 2 DM represented the majority of patients studied in religious fasting. 91.3% of patients in Epidemiology of Diabetes and Ramadan (EPIDAR) study and 80% of patients in a French study, Ramadan fasting with diabetes, were Type 2 diabetic patients., All diabetic patients in our study had Type 2 DM and patients with Type 1 DM were excluded from the study. Effects of fasting are expected to be different among patients according to type of DM due to difference in the pathophysiology of DM and metabolic effects of fasting itself. Therefore, studying the impact of fasting should be addressed to one type of diabetic patients rather than including Type 1 and Type 2 DM patients in the same study. More than 2/3 of the patients included in both EPIDAR and the French studies received medical education about fasting in Ramadan, while the patients in our study had fasted without consultation with their doctors. There was lack of medical education among diabetic Orthodox Christian patients about fasting in our community. The diabetic patients in our study were treated more frequently with oral antidiabetic drugs than with insulin. Patients with Type 2 DM were reported to be more frequently treated with oral antidiabetic agents than insulin during religious fasting., In the previous studies including ours, insulin therapy was less frequently used during fasting period among Type 2 diabetic patient. Poor compliance of the patients, increased risk of hypoglycaemia and length of the period of fasting could encourage patients to prefer oral medications during fasting rather than insulin therapy. Our study revealed favourable outcome is reduction of SBP and DBP among diabetic patients. However, no significant changes were detected in blood pressure in non-diabetic group. The effects of religious fasting on blood pressure had shown conflicting results. Yarahmadi et al. showed that blood pressure did not change during Ramadan fasting among Type 2 diabetic Muslim patients. Papadaki et al. reported that SBP increased during Greek Orthodox Christian fasting periods and the fasters' DBP did not change. Sarri et al. reported no change in the SBP when fasters were compared with non-fasters during Greek Orthodox Christian fasting. He also reported that non-fasters' DBP decreased significantly during fasting periods when compared to the changes in fasters' DBP. Several factors, other than fasting, can affect blood pressure such as physical activities and emotional stress. In addition, the above studies were conducted in different geographic locations that involved different races, habits and different fasting definition. Greek Orthodox Christian fasting in our study showed positive impact on anthropometric measures including body weight, BMI and waist circumference. This favourable outcome was detected in both diabetic and non-diabetic groups. Several studies showed controversy about changes in body weight and BMI in diabetic patients in religious fasting. Papadaki et al. observed a near-significance (P = 0.059) decrease in the average body mass of Greek Orthodox Christian monks during a fasting week. During Ramadan fasting, there were no changes in BMI in some reports,,,, while others reported decrease in body weight and BMI.,, Change in the body weight and BMI is related to type and amounts of food and physical activity. The duration of religious fasting is variable from 1 year to another, and this could be a contributing factor affecting the body weight and BMI. In the current study, no significant reduction was detected in FBG after fasting compared to before fasting in diabetic patients and non-diabetic subjects as well. Religious fasting has variable effects on blood glucose (BG). On evaluating the effects of Greek Orthodox Christian Church fasting on serum lipids and obesity, Sarri et al. revealed no significant changes in the mean pre-fasting values of BG compared to the mean end-fasting values in the group of fasters. Moreover, no significant change in BG was detected between fasters and the control group. Papadaki et al. reported no significant changes in the fasting serum glucose in Greek Orthodox Christian monks in comparing fasting and non-fasting week. However, no diabetic patients were included by Sarri et al. or by Papadaki et al. in these studies., Studies discussed fasting among Type 2 diabetic patients during Ramadan showed discrepancy in BG level changes.,,, These differences could be attributed to the changes in the pattern and duration of fasting in the religion. Other factors, such as amount or type of the food and decreased physical activities during fast, also could modulate metabolic effects of religious fasting. HbA1c level of the patients in this study was observed to decrease significantly after fasting compared with it before fasting. Khatib and Shafagoj reported decrease in HbA1c level among non-insulin-dependent DM Muslim patients during fasting in Ramadan. However, several studies suggested that HbA1c values did not change during Ramadan fasting.,, The impact of Christian fasting on HbA1c is lacking in the literature. Our study showed decrease in the mean value of TGs and increase in the mean value of HDL after fasting compared to before fasting in Group I. However, TGs, cholesterol, LDL and HDL values in our study showed non-significant changes in their level after fasting compared with before fasting in diabetic patients. Lack of significant effect of changes in the lipid profile among diabetic and non-diabetic individuals could be partially explained by use of lipid-lowering agents. However, many studies discussed fasting in Greek Orthodox showed discrepancy in the lipid profile changes even among those who did not take any medication. Sarri et al. reported that both TC and LDL-C levels decrease during Christmas fasting period among the Greek Orthodox Christian fasters. Sarri et al. reported significant decrease TC, HDL-C, LDL-C levels in mean pre-fasting values compared to mean end-fasting values in the group of Greek Orthodox Christian Church fasters. However, no significant changes in LDL-C/HDL-C ratio or in the triglyceride levels were detected. The included participants did not suffer from any disease and did not take any medication. However, Papadaki et al. reported no change in HDL-C levels, decrease in TC/HDL-C ratio and increase in the triglyceride levels among health monks during fasting periods. Religious fasting among Type 2 diabetic patients during Ramadan also showed variable changes in the lipid profile.,,, Marked variation in the metabolic effects of religious fasting on lipid profile could be attributed to several factors. Differences in the nature of the religion and nature of fasting within same religion should be considered. Compliance to medication, physical activity, seasonal food variation, eating habits and period of fasting should also be considered. Our study has some limitations. First, it was conducted on a limited number of diabetic patients in a single church in Sohag. However, Sohag San George Church is one of the biggest churches in Sohag, and there was no limit for the participation of the patients as long that they fulfilled the inclusion criteria. Second, we did not follow the patients and persons after fasting to evaluate the presence of sustained effects of the changes that had occurred during fasting period. Finally, we did not regularly follow the BG of our patients during fasting to document variation of BG levels. However, our study was the first study about the metabolic effects of Coptic Orthodox Christian fasting among patients with Type 2 DM in our locality and one of the few studies about this issue in Egypt and the Middle East. Further studies including more parameters in the evaluation of the Coptic Orthodox Christian fasting in diabetic patients are recommended. 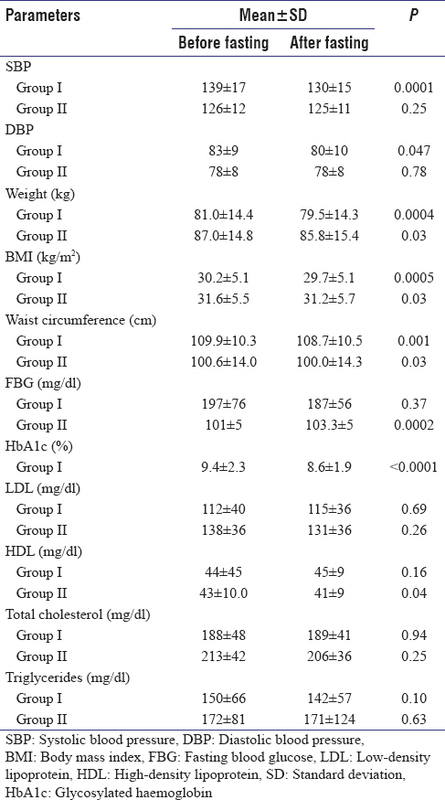 Coptic Orthodox Christian fasting during Great Lent has small but significant reducing effects and favourable outcome on blood pressure, waist circumference, BMI and HbA1c among patients with Type 2 DM with no significant changes in the lipid profile. It has also some beneficial effect in non-diabetic fasters. Those patients do not receive any education or consultation before the start of fasting. A further larger study including a larger number of people and additional metabolic parameters is recommended. In collaboration with the Egyptian Orthodox Christian Church authorities, these courses have to be regularly delivered to both Orthodox Christian diabetic patients and church priests to ensure safe fasting for those who are willing and intending to fast. Shatenstein B, Ghadirian P. Influences on diet, health behaviours and their outcome in select ethnocultural and religious groups. Nutrition 1998;14:223-30. Temizhan A, Tandogan I, Dönderici O, Demirbas B. The effects of Ramadan fasting on blood lipid levels. Am J Med 2000;109:341-2. Adlouni A, Ghalim N, Benslimane A, Lecerf JM, Saile R. Fasting during Ramadan induces a marked increase in high-density lipoprotein cholesterol and decrease in low-density lipoprotein cholesterol. Ann Nutr Metab 1997;41:242-9. Maislos M, Khamaysi N, Assali A, Abou-Rabiah Y, Zvili I, Shany S, et al. Marked increase in plasma high-density-lipoprotein cholesterol after prolonged fasting during Ramadan. Am J Clin Nutr 1993;57:640-2. Maislos M, Abou-Rabiah Y, Zuili I, Iordash S, Shany S. Gorging and plasma HDL-cholesterol – The Ramadan model. Eur J Clin Nutr 1998;52:127-30. Akhan G, Kutluhan S, Koyuncuoglu HR. Is there any change of stroke incidence during Ramadan? Acta Neurol Scand 2000;101:259-61. Temizhan A, Dönderici O, Ouz D, Demirbas B. Is there any effect of Ramadan fasting on acute coronary heart disease events? Int J Cardiol 1999;70:149-53. Akanji AO, Mojiminiyi OA, Abdella N. Beneficial changes in serum Apo A-1 and its ratio to Apo B and HDL in stable hyperlipidaemic subjects after Ramadan fasting in Kuwait. Eur J Clin Nutr 2000;54:508-13. Friedlander Y, Kark JD, Kaufmann NA, Stein Y. Coronary heart disease risk factors among religious groupings in a Jewish population sample in Jerusalem. Am J Clin Nutr 1985;42:511-21. Friedlander Y, Kark JD, Stein Y. Religious observance and plasma lipids and lipoproteins among 17-year-old Jewish residents of Jerusalem. Prev Med 1987;16:70-9. Fraser GE. Associations between diet and cancer, ischemic heart disease, and all-cause mortality in non-Hispanic white California Seventh-day Adventists. Am J Clin Nutr 1999;70:532S-8S. Fraser GE. Diet as primordial prevention in Seventh-day Adventists. Prev Med 1999;29:S18-23. Nieman DC, Underwood BC, Sherman KM, Arabatzis K, Barbosa JC, Johnson M, et al. Dietary status of Seventh-day Adventist vegetarian and non-vegetarian elderly women. J Am Diet Assoc 1989;89:1763-9. Sarri KO, Tzanakis NE, Linardakis MK, Mamalakis GD, Kafatos AG. Effects of Greek orthodox Christian church fasting on serum lipids and obesity. BMC Public Health 2003;3:16. Salti I, Bénard E, Detournay B, Bianchi-Biscay M, Le Brigand C, Voinet C, et al. A population-based study of diabetes and its characteristics during the fasting month of Ramadan in 13 countries: Results of the epidemiology of diabetes and Ramadan 1422/2001 (EPIDIAR) study. Diabetes Care 2004;27:2306-11. Gaborit B, Dutour O, Ronsin O, Atlan C, Darmon P, Gharsalli R, et al. Ramadan fasting with diabetes: An interview study of inpatients' and general practitioners' attitudes in the South of France. Diabetes Metab 2011;37:395-402. Ahmedani MY, Alvi SF, Haque MS, Fawwad A, Basit A. Implementation of Ramadan-specific diabetes management recommendations: A multi-centered prospective study from Pakistan. J Diabetes Metab Disord 2014;13:37. Yarahmadi Sh, Larijani B, Bastanhagh MH, Pajouhi M, Baradar Jalili R, Zahedi F, et al. Metabolic and clinical effects of Ramadan fasting in patients with type II diabetes. J Coll Physicians Surg Pak 2003;13:329-32. Papadaki A, Vardavas C, Hatzis C, Kafatos A. Calcium, nutrient and food intake of Greek orthodox Christian monks during a fasting and non-fasting week. Public Health Nutr 2008;11:1022-9. Sarri K, Linardakis M, Codrington C, Kafatos A. Does the periodic vegetarianism of Greek orthodox Christians benefit blood pressure? Prev Med 2007;44:341-8. El Ati J, Beji C, Danguir J. Increased fat oxidation during Ramadan fasting in healthy women: An adaptative mechanism for body-weight maintenance. Am J Clin Nutr 1995;62:302-7. Rakicioğlu N, Samur G, Topçu A, Topçu AA. The effect of Ramadan on maternal nutrition and composition of breast milk. Pediatr Int 2006;48:278-83. Ibrahim WH, Habib HM, Jarrar AH, Al Baz SA. Effect of Ramadan fasting on markers of oxidative stress and serum biochemical markers of cellular damage in healthy subjects. Ann Nutr Metab 2008;53:175-81. Maughan RJ, Bartagi Z, Dvorak J, Zerguini Y. Dietary intake and body composition of football players during the holy month of Ramadan. J Sports Sci 2008;26 Suppl 3:S29-38. Bouhlel E, Zaouali M, Miled A, Tabka Z, Bigard X, Shephard R, et al. Ramadan fasting and the GH/IGF-1 axis of trained men during submaximal exercise. Ann Nutr Metab 2008;52:261-6. Khaled BM, Belbraouet S. Effect of Ramadan fasting on anthropometric parameters and food consumption in 276 type 2 diabetic obese women. Int J Diabetes Dev Ctries 2009;29:62-8. Ziaee V, Razaei M, Ahmadinejad Z, Shaikh H, Yousefi R, Yarmohammadi L, et al. The changes of metabolic profile and weight during Ramadan fasting. Singapore Med J 2006;47:409-14. Salehi M, Neghab M. Effects of fasting and a medium calorie balanced diet during the holy month Ramadan on weight, BMI and some blood parameters of overweight males. Pak J Biol Sci 2007;10:968-71. Bernieh BO, Mohamed AO, Wafa AM. Ramadan fasting and renal transplant recipients: Clinical and biochemical effects. Saudi J Kidney Dis Transpl 1994;5:470-3. Khatib FA, Shafagoj YA. Metabolic alterations as a result of Ramadan fasting in non-insulin-dependent diabetes mellitus patients in relation to food intake. Saudi Med J 2004;25:1858-63. Gustaviani R, Soewondo P, Semiardji G, Sudoyo AW. The influence of calorie restriction during the Ramadan fast on serum fructosamine and the formation of beta hydroxybutirate in type 2 diabetes mellitus patients. Acta Med Indones 2004;36:136-41. Sari R, Balci MK, Akbas SH, Avci B. The effects of diet, sulfonylurea, and repaglinide therapy on clinical and metabolic parameters in type 2 diabetic patients during Ramadan. Endocr Res 2004;30:169-77. Sarri K, Bertsias G, Linardakis M, Tsibinos G, Tzanakis N, Kafatos A, et al. The effect of periodic vegetarianism on serum retinol and alpha-tocopherol levels. Int J Vitam Nutr Res 2009;79:271-80. Fakhrzadeh H, Larijani B, Sanjari M, Baradar-Jalili R, Amini MR. Effect of Ramadan fasting on clinical and biochemical parameters in healthy adults. Ann Saudi Med 2003;23:223-6. Ramadan J, Telahoun G, Al-Zaid NS, Barac-Nieto M. Responses to exercise, fluid, and energy balances during Ramadan in sedentary and active males. Nutrition 1999;15:735-9.